2′, 7′-Difluorocarboxyfluorescein Azide, 6-isomer (also under Oregon Green 488 Azide (Oregon Green™ 6-Carboxamido-(6-Azidohexanyl), Triethylammonium Salt), 6-isomer name) is a bright, green-fluorescent azide-activated probe that reacts with terminal alkynes via a copper-catalyzed click reaction (CuAAC). It also reacts with strained cyclooctyne via a copper-free click chemistry reaction to form a stable triazole and does not require Cu-catalyst or elevated temperatures. 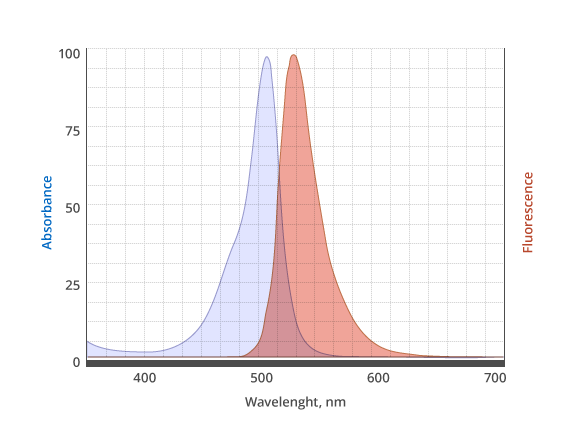 2′,7′-Difluorocarboxyfluorescein fluorinated analog of fluorescein that overcomes some of the key limitations of fluorescein, including greater photostability and a lower pKa (pKa ~ 4.7 versus 6.4 for fluorescein), making its fluorescence essentially pH insensitive in the physiological pH range. Click the link to see our other classic fluorescent dyes. Alexa Fluor® Dyes and Oregon Green Dye is a registered trademark of Invitrogen, part of Thermo Fisher Scientific. Fluoroprobes is not affiliated with or endorsed by Thermo Fisher Scientific. 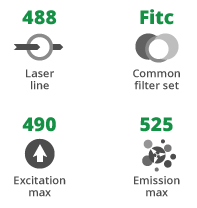 AF Dyes are GENERIC versions of Alexa Fluor® Dyes and ARE NOT manufactures, distributed, or affiliated in any way with Thermo Fisher Scientific.